The enamelling on this unusual pair of bottles is typical of wares made for the commercial market during the mid-Qing period. (The second bottle, Treasury 6, no. 1258, will appear in the seventh Bloch auction.) Alongside the masterly imperial ceramics of the day, cruder wares were made with less well-refined enamels and more decorative painting, and these fit comfortably into that output. The survival of two identical bottles suggests that they must have been made as a series, like imperial wares. Much of the work in producing a new model at a kiln lay in the designing and production of the mould. Once that was done, multiple bottles could be produced to the same pattern and from the same mould; in this case, one mould would suffice to produce each bottle, since the form is just a simple, compressed sphere tapering slightly towards the flared neck. All decoration was painted on afterwards. Another bottle, of the same shape and colour scheme but of a different design of melons and butterflies is found in the Walters Collection, formed in the 1870s and 1880s (Bushell 1980, p. 216, fig. 281, also in JICSBS, September 1975, p. 7, no. 11). Other examples are in Hong Kong 1977, no. 102, and Hui, Polak, and Sin 1991, no. 143. 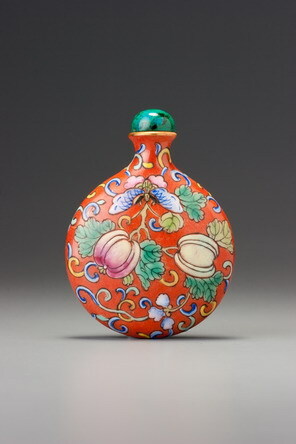 A related bottle, of similar design but with a yellow ground, was in the Szekeres Collection (Sotheby’s, New York, 27 October 1986, lot 6). The exterior of these two bottles was entirely covered in glaze before enamelling, so it must have been fired on a rod that held it upside down in a saggar within the kiln. Even the lip is covered with the slight brown glaze so common under a gold-enamelled lip; it is as if the potters expected the gold to eventually wear off (as it did) and wanted a somewhat similar colour to show through (as it does).